The electric sit stand desk integrates modern technology into the backbone of its construction for a hassle-free ergonomic experience. Simply push the up/down arrows to raise or lower the desk, and conveniently program up to four favorite levels to make switching positions a breeze. Optional rolling casters eliminate heavy lifting, and the locking wheels provide stability when the desk is stationary. Streamline and hide pesky cables and wires with the cable management system to give the workstation an extra polished and organized appearance. Take charge of your office equipment, and let this electric sit stand desk deliver you automated support for both your health and productivity today! SARAH (Narrator): "Today’s modern workflow leaves the average person sitting for approximately 9 hours a day. You don’t need to be a doctor to understand that there are consequences  to a sedentary lifestyle like this. But thankfully, there’s a great ergonomic solution to get your workday out of that unhealthy slump. Sit-stand desks are a great way to prevent your office job from being a pain in your back! Check out all the features that this electric sit stand desk has that will revolutionize the way you work! A programmable module allows you to move the desks’ position vertically, ranging from 24 to 49 inches high, all with the touch of a button. The memory programming feature allows you to save up to 4 of your most commonly used heights for added convenience. Rolling casters allow for mobility or they can be locked to keep the desk in place. Or change the wheels out for adjustable foot levelers. A built in cable management system keeps  cords hidden and organized. 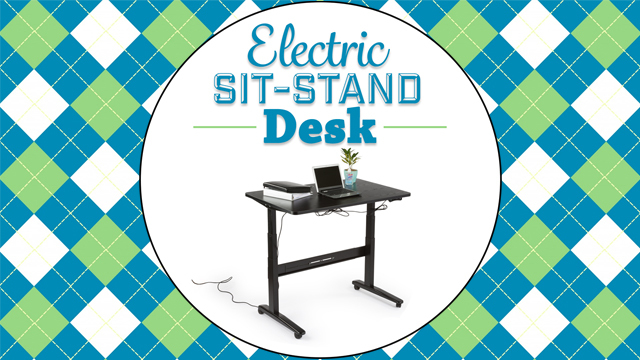 Let this electric sit stand desk transform your sedentary workday into something that you can stand up for!"